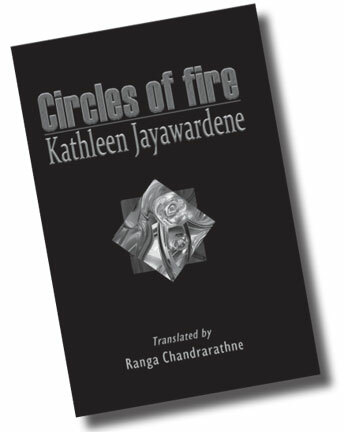 Kathleen Jayawardene’s Circles of Fire (Agni Chakra) has accomplished the rare feat of gaining immense popularity among readers while garnering accolades from discerning critics. The author has a remarkable ability to reconfigure emotionally charged situations and deep and troubling human crises in memorable language. As many literary critics have accurately pointed out Kathleen Jayawardene possesses a gift for narrative and controlled use of language that contains both emotional power and gravitas. At a time when many Sinhala writers find it a challenging task (grammatically speaking) to get the subject to agree with the predicate, she is able to write fluently and with self-assurance; she is clearly sensitive to the music of language. Her vigorous and elegant prose carries us towards a dense texture of people and place. The fourth edition of this novel was published recently, and now it has been rendered into English under the title Circles of Fire. Ranga Chandrarathne has translated this novel into English, and I would like to state at the outset that he has done a very good job as a critical translator who has successfully navigated between the competing demands of two languages. His translation belongs to what I term critical translation; I shall explain the importance of this concept a little later. Circles of Fire centers round the character of Saddhamangala Siriniwasa who happens to be a university professor who is held in high esteem. His life, his emotions, his limitations, his psychological complexities and their dark underside constitute the emotional center of gravity of the novel. The way he has surrendered himself to the pleasures of the present draws a sympathetic response from the novelist. The author has presented a psychologically troubled character whose predicament has to be understood in relation to a plurality of variables beginning with his childhood experiences. Although this work of fiction is generally characterized as a psychological novel, it is important to bear in bind that this psychological complexity operates within a specific cultural discourse; hence a cultural-psychological approach to the understanding of Prof. Siriniwasa’s life would be more appropriate and productive. It is a fact, seldom denied even by the most ardent psychological critics, that a psychologically-oriented novel can and does have serious cultural implications. The narrative discourse of Circles of Fire, as indeed in some of her other novels, is driven by the concept of desire. The unfolding events of the novel draw attention to the complex facets that go to form human desire, and how that formation of desire can very often elude our conceptual grasp. Kathleen Jayawaerdene is familiar with modern theorists who have written illuminatingly on desire such as Lacan, Foucault and Barthes; however her locutions and tropes signal that her understanding of desire has deep roots in Buddhist metaphysics. It is indeed her ambition to extend the horizons of our understanding of human desire. What is interesting about her attempt is that it is culturally-inflected. In discussing her novel in particular, and the Sinhala novel in general, I wish to invoke the concept of the novel as a cultural text. Whether we view the novel from the vantage point f the writer or the text or the reader or the context, the cultural discourse emerges as a powerful force. One thing that strikes many commentators on Sinhala literature is that readers are good at reading the lines, but not so adept in reading between the lines. Indeed, the true meaning and the power of a work of literature reside in the interstitial space between the lines. And to figure out the true meaning of what is taking place in between the lines one has to bring into play a strong cultural imagination. This is an argument tat Kathleen Jayawardene implicitly makes through her narrative. The life of Prof. Siriniwasa can be understood in its true complexity only if we are able to locate his imaginings and activities within the discourse of culture. Then the indubitable psychological complexities begin to gain in greater depth and clarity. It is generally believed that emotions – love, anger, jealousy, sadness, remorse etc. – are universal. This is indeed true so far as it goes. However, we need to bear in mind the fact that emotions do not fall from the sky; they are grounded in culture and are culturally constructed. Furthermore, the expression of emotions is influenced and facilitated by culture. Perceptive novelists such as Martin Wickremasinghe and Gunadasa Amarasekera are fully aware of this fact. The author of Circles of Fire recognizes the importance of the determinative influence of culture. Throughout the novel, there are passages such as the following which underline the formative influence of culture. ‘Yes, Prof. Siriniwasa, as an academic and acclaimed writer, I would like to know how far this perception shame is associated with our culture. Sanskruthiya is culture in English. I relaxed on the chair. Culture is one of the more complex words in the English language, a western philosopher had stressed it,’ After that I paused a little to recall the name of that philosopher but I could not access the pages of my memory on the spot and in such haste!’ The thinker who is being referred to here, I believe, is my former teacher Raymond Williams. He once famously said that the word culture is among the two or three most complicated words in the English language. He has in his theoretical writings as well as historical studies opened up interesting avenues of inquiry that we could follow productively. The kind of cultural-materialist critique that he underlined not only displays the importance of understanding novels as cultural texts but also points the way towards invigorating modes of fictional analysis. In order to fathom the deeper structures of Circles of Fire, we need to pay closer attention to the nexus between the fictional text and the culture that it grows out of. There is a widespread notion, not totally unreasonable I might add, that maintains that important novelists inhabiting a specific culture and working in and through it seek to highlight the pivotal concerns and centers of interest of that culture. However, the situation is more complexly ambiguous and therefore invites more focused analysis. As the eminent social thinker Herbert Marcuse observed, ‘there is no work of art which does not break the affirmative stance by the power of the negative, which does not, in its very structure, evoke words, the images, the music of another reality, or another order repelled by the existing one and yet alive in memory and anticipation, and alive in what happens to men and women, and their rebellion against it. When this tension between affirmation and negation, between pleasure and sorrow, higher and material culture no longer prevails, where the work no longer sustains the dialectical unity of what is and what can (and ought to be), art has lost the truth, has lost itself.’ Kathleen Jayawardene recognizes the importance of this line of thinking. She seems to be searching in her fiction for cultural truths that are complex and many-sided. What she has aimed to do in her novel is to focus on the interplay between the good and bad, positive and negative, in culture, and the human crisis that is at the heart of her novel; it gains in depth when seeing in this light. In other words, what she is challenging us, as readers, to do is to read against the grain. This is indeed what contemporary literary theorists refer to as symptomatic reading. A symptomatic reading entails the uncovering of hidden narratives within the dominant one, and focus on the effective role of ideology in the conduct of characters. Earlier on I stressed the importance of reading between the lines; this is where we end up when we opt to do so. While the intersections of fiction and culture are indeed significant, we should not ignore the fact that the novelist rises or falls through his or her ability to fashion a craft, an artistic style that is adequate to the experience envisaged. Kathleen Jayawardene is a novelist who values the importance and possibilities of craft. Let us consider the opening passages of the novel. Whenever I thought of getting married, I experienced a mild anxiety. I did not doubt much that marriage should be the fruit of love or should be a sacred institution. I have neither knowledge nor feeling about it. If I say it in unambiguous terms, marriage for me is mere contract in life. When I think of women, what comes to mind often is the proverb, stone and flowers. The symbolism summoned by these paragraphs is significant in view of the fact that it informs the entire narrative discourse of the novel and shapes our responses to it. The flow f the narrative is contained within the two poles of the flower and stone. Hence, it can be said that what we find in this novel is not a mimetic transcript of culture but an active reconfiguration of it making use of all the resources and representational strategies that the novelist has at her disposal. When we say that a novel is a cultural text, we do not imply that it precluded artistry and creativity. In fact it is precisely in the way that these two are combined – the imperatives of a cultural text and the imperatives of fictional art – that a novel comes to life. The way the idea of the novel as a cultural text and the way the necessary imperatives of fictional art interact deserve careful study. A cultural text normally focuses on behavior while a literary text focuses on experience. How an experience has been encoded in cultural terms testifies to a novelist’s talents. In this regard the distinction between behavior and experience highlighted by the anthropologist Edward M. Bruner is important. He says that, ‘behavior ‘implies an outside observer describing someone else’s actions, as if one were an audience to an event; it also implies a standardized routine that one simply goes through. An experience is more personal, as it refers to an active self, to a human being who not only engages in but shapes an action.’ It is the vivid recreation of experience that Kathleen Jayawardene is after. In conclusion, I wish to make a comment on Ranga Chandrarathne’s able and imaginative translation. One can say that there are two broad approaches to literary translation. On the one hand, the translator can try to remain as close as possible to the original text without taking too many liberties to sound more natural in the host language. On the other hand, the translator can chose to make his or her rendering freer and in the process sound more natural in the host language. Translations are tradeoffs and hard choices have to be made. It seems to me that Chandrarathne has succeeded in avoiding both extremes; moreover, he has labored to achieve something unreservedly laudable – to practice an art of critical translation. What do I mean by the term critical translation? The translator, as he or she renders the original into the host language, also attempts to pass critical judgments on the original text implicitly through the very choices made. This is certainly not easy; it requires distinct linguistic capabilities as well sharp critical perceptions. An illustrative analogue would be the way that a Brechtian actor plays his or her role; as he or she plays the role, he or she also aims to make critical judgments on the character he or she is impersonating. Brecht, of course did no always succeed in achieving the goals he set for himself as adumbrated in his famed epic theatre. On the basis of the promise held out by Circles of Fire, one can predict a good future for Kathleen Jayawardene as a novelist. However, at this point, my advice to her would be don’t rush to produce works of fiction too hastily ( a common enough temptation among many Sinhala novelists) and allow your chosen experiences gestate, and enable the full gravitas of the experience to emerge gradually through repeated reflection. This will also permit the novelist to discern the deeper patterns mutely forming beneath the flow of life. In addition, working and re-working over the manuscript will enable a novelist to avoid unnecessary blemishes. After all, Leo Tolstoy re-wrote his epic novel War and Peace seven times.